my inspiration from this post came from my girls over at weheartthis.com, their instagram feed is a gem where you will find lifestyle, beauty and product tips. they recently posted a group of images from their meet up with COVERGIRL stylists and i spotted this tip: 'heat changes the shape of your hair, cooling sets it in'. it is as if a lightbulb went off and my info-graphic minded self immediately. how can i NOT share this information with you?! every hair dryer i have ever purchased has come with a diffuser, a concentrator and a heating & cooling switch. the question is, what do you do with all of these gadgets? first, the concentrator. this attachment concentrates the airflow to a specific area for better styling. the air current is forced into one condensed direction and when aimed appropriately, from root to hair tip, it helps to seal the hair cuticle. sealing the hair cuticle is what creates smooth, silky, shiny hair. you don't want to blow dry without it. second, the diffuser. this alien looking instruction helps to circulate the air that comes out of the blow dryer which prevents 'hot spots' when blow drying. the circulated air will heat hair evenly and dry hair evenly, which is the key to frizz free curly/wavy hair. the hot and cool button - like i mentioned before - are the key to shaping your hair and setting it. you blow dry with the heat setting and when you want to set the style you cool it for a few moments with the 'cool' button. my preferred method with to roll a section of your hair up into a round brush while blow drying with the heat button. continue to hold the hair in the round brush and blast with the cool button until hair cools. this will 'set' your style. last but not least, keep your tools clean! 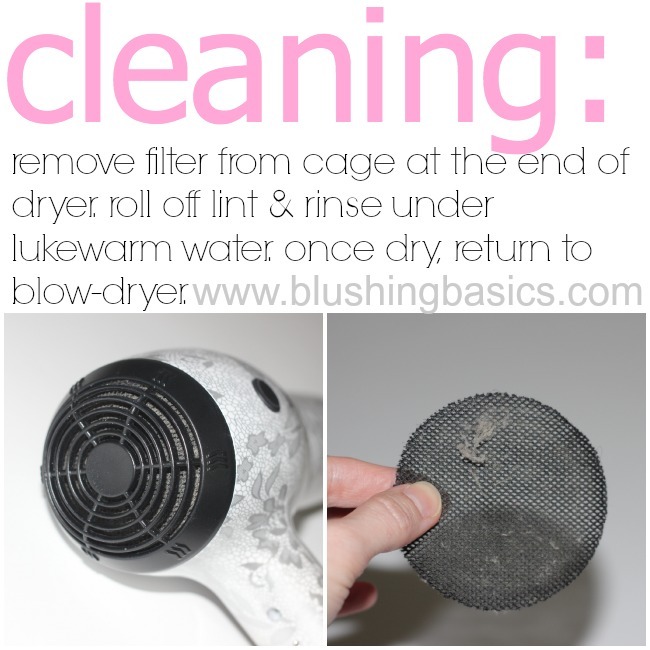 a clean air filter in a dryer will go a long way towards a better blow dry (more efficient, less likely to overheat!). keeping your brushes clean and free of build up will allow hair to style without buildup. a few quick moments of cleaning will protect your tools for years to come. Good reminder to clean the dryer! Yikes. It's been a while. Found you today from #BeautyBuzz.